This is life in the new Greece: People are angry and break into riot and any provocation, and the state is poor and will take any excuse to cut costs. 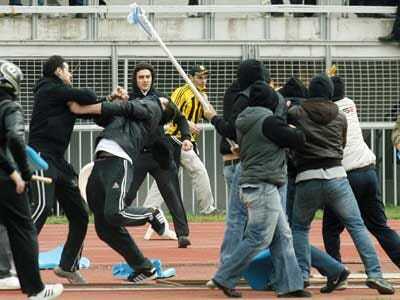 Hooliganism has become such a problem at Greek soccer games that fans were banned from away games. But serious clashes occurred this weekend at three league matches. The AP reports hundreds clashed on pitch and outside the stadium before a Greek cup game in the northern town of Kavala. Sports secretary Panayiotis Bitsaxis announced a €40 million cut in state funding for soccer, suspended until the league can reign in its hooligans. For the Papandreou regime, it’s a clever grab of money needed to qualify for the EU bailout. But this is going to really piss off the already-angry Greeks.